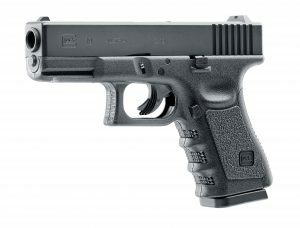 The 9x19mm GLOCK 19, or G19 as it’s often known, was designed for a more versatile role in operations. It’s compact size and reduced dimensions compared to the original GLOCK 17 made it a favourite amongst both private and public security agencies. As well as being an ideal conventional service pistol, it is ideal for concealed carry or as a backup weapon. The GLOCK 19 was first produced by GLOCK in 1988 specifically for military and law enforcement purposes. Overall, the barrel and pistol grip are approx. 12mm shorter than that of the GLOCK 17. However, the mass of the slide on the GLOCK 19 is the same as the GLOCK 17 to maintain the same exceptional handling characteristics. In 2015 and current to today, the GLOCK 19 is the pistol used by the United States Air Force, United States Marine Corps and SOCOM. 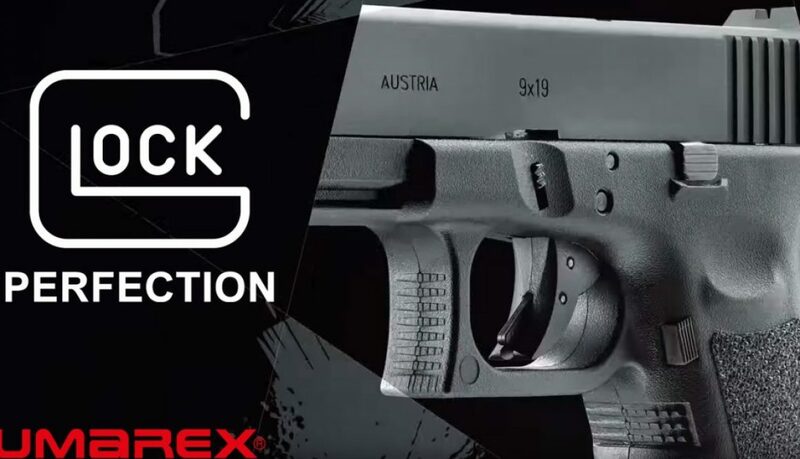 For the first time ever, UK Shooters can now own a GLOCK 19 officially licensed replica, manufactured by German airgun powerhouse Umarex. This UK-legal pistol can be bought from all good gun shops and owned without the need for any licence. 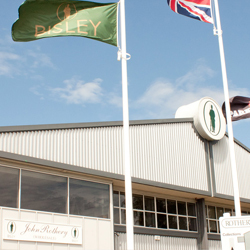 However, all current UK airgun laws must be adhered to, including the minimum age for purchase/use and storage laws. So, let’s take a closer look at this fantastic replica. The first thing you notice when you pick up the GLOCK 19 is just how realistic it feels. Produced under the first ever worldwide licence issued by GLOCK, you would expect all models produced to be perfect and as close to the original as possible. The GLOCK 19 certainly lives up to these expectations. It features a similar heavy metal slide with polymer grip as you would find on the original pistol, as well as all the original marking including GLOCK logos and 9×19 calibre etching, although this is the 4.5mm BB airgun model. Most brilliantly is the operational trigger safety. 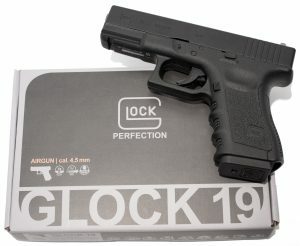 This feature on GLOCK pistols is one of the reasons why GLOCK has been adopted into military and law enforcement use, it gives the ability for the pistol to be ready to shoot as soon as it is drawn from any holster a whilst remaining completely safe inside the holster or if it is accidentally knocked or dropped. On this 4.5mm BB model, the trigger safety operates in the same way. The pistol cannot be shot until the user is completely ready to take the shot, without the need to flip or move an extra safety lever. This GLOCK 19 air pistol is powered by the readily available standard 12g Co2 capsules. The backstrap of the pistol is removed to reveal a hidden Allen key which is then used to loosen the cartridge screw to remove any empty cylinder and replace it with a new one. 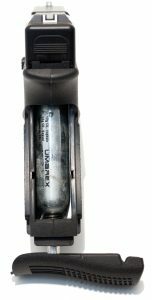 Once tightened, the 12g capsule is pierced at the top by the internal valve system which, in turn, releases a small amount of Co2 each time the trigger is pulled.